Form: The sponge consists of a basal reticulation of thin-walled tubes which creep and anastomose over the substrate, from which arise numerous, long, free-standing, closely-set oscular tubes which are always provided with lateral diverticula, which may subdivide even further. "It occurs as a bushy form and as an arborescent form." Consistency: Very delicate and soft; "very fragile". Surface: That of the tubes is soft and smooth; "minutely hispid". Apertures: The oscules are terminal on erect tubes. "The oscular rim is short." Contraction: The tubes cling together by surface tension when out of the water. Otherwise no noticeable contraction occurs. Skeleton: The skeleton of the chamber layer consists of triradiates. The endosomal skeleton is of quadriradiates, which also line the atrial cavity. Oxea are also present. Spicules: Triradiates have paired rays 75-90 x ca. 7µm thick and basal ray 100-200µm long x ca. 6µm thick. Quadriradiates have basal ray 100-200µm long x ca. 6µm thick, the other rays are 70-90 x ca.7µm. The oxea are of two sizes; the larger, 190-280 x 9-10µm thick, usually have lanceolate distal ends and curved shafts; the smaller are usually abundant, without lanceolate endings, 70-140 x ca. 3µm thick. 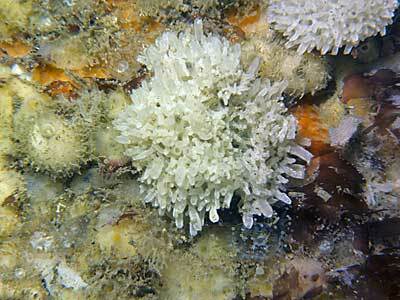 Habitat: This sponge reaches its optimal development under overhangs on the shore, growing as compact, hanging 'bunches', often associated with the red alga, Plumaria elegans. "Rarely found in situations in which it is liable to be left dry at low tide." The 'bushy form' may be more typical of muddy estuarine conditions; the 'arborescent form' of clean water, free of mud and sediment? Observations would be welcome on this feature. Distribution: "Arctic; Atlantic coasts of Europe; Mediterranean, etc." "Littoral to 93m." Identity: Superficially this species can be confused with several other 'Named Forms' of Leucosolenia, including L. botryoides, L. variabilis and L. contorta. Can field characters be established to separate them?